Even 30 years after the discovery of magainins, biophysical and structural investigations on how these peptides interact with membranes can still bear surprises and add new interesting detail to how these peptides exert their antimicrobial action. Early on, using oriented solid-state NMR spectroscopy, it was found that the amphipathic helices formed by magainins are active when being oriented parallel to the membrane surface. More recent investigations indicate that this in-planar alignment is also found when PGLa and magainin in combination exert synergistic pore-forming activities, where studies on the mechanism of synergistic interaction are ongoing. 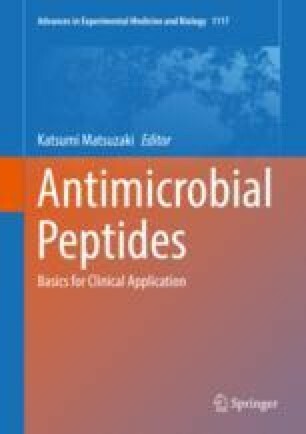 In a related manner, the investigation of dimeric antimicrobial peptide sequences has become an interesting topic of research which bears promise to refine our views how antimicrobial action occurs. The molecular shape concept has been introduced to explain the effects of lipids and peptides on membrane morphology, locally and globally, and in particular of cationic amphipathic helices that partition into the membrane interface. This concept has been extended in this review to include more recent ideas on soft membranes that can adapt to external stimuli including membrane-disruptive molecules. In this manner, the lipids can change their shape in the presence of low peptide concentrations, thereby maintaining the bilayer properties. At higher peptide concentrations, phase transitions occur which lead to the formation of pores and membrane lytic processes. In the context of the molecular shape concept, the properties of lipopeptides, including surfactins, are shortly presented, and comparisons with the hydrophobic alamethicin sequence are made. We gratefully acknowledge the discussion with and contributions from many coworkers and colleagues from our own team and from outside. We are grateful to Ekaterina Zaitseva for her feedback on electrophysiology and Roland Stote for much helping to refine the text on molecular dynamics. Over the years, the Agence Nationale de la Recherche (projects TRANSPEP 07-PCV-0018, ProLipIn 10-BLAN-731, membraneDNP 12-BSV5-0012, MemPepSyn 14-CE34-0001-01, InMembrane 15-CE11-0017-01, Biosupramol 17-CE18-0033-3, and the LabEx Chemistry of Complex Systems 10-LABX-0026_CSC), the IRTG Soft Matter Science (Freiburg, Strasbourg), the Marie-Curie Research and Training Network 33439 of the European Commission BIOCONTROL, the University of Strasbourg, the CNRS, the Région Alsace, the RTRA International Center of Frontier Research in Chemistry, and the French Foundation for Medical Research (FRM) have provided financial support. BB thanks the Institut Universitaire de France for providing additional time to be dedicated to research.